When is a chair more than simply a piece of furniture? When it's an iconic piece of American design? When it's a status symbol? A hallmark of success, authority and good taste? The Eames Lounge Chair is all of these and on top of those lofty attributes, it's cushy and comfortable to sit in as well. Introduced 55 years ago by husband-and-wife team Charles and Ray Eames for the Herman Miller furniture company, the unique looking chair is part sculpture, part recliner—a La-Z-Boy for the high minded. Citing inspiration from the traditional English club chair, Charles Eames once famously remarked he wanted to construct a chair with "the warm receptive look of a well-used first baseman's mitt." And once you sit it one, you find out that he wasn't all talk. The cushions are softer than expected and the seat is permanently tilted at a 15-degree angle to take the weight off your lower spine. Meaning you've got no choice but to relax and get comfortable. Which may explain why it instantly became the chosen chair by such big shots as CEOs, psychiatrists, college deans or architects. The chair continues to be a favorite among elites and aesthetes of all kinds. 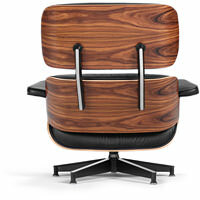 Scott Sternberg, the designer of Band of Outsiders, has a vintage Eames lounge chair in his office. The chair has been in continuous production since its introduction. Each piece—from the seven-ply wood veneer to the die-cast aluminum braces to the tufted leather—utilizes the best materials, all assembled by hand here in the states. It's not cheap. Even a table-top miniature (handmade to one-sixth scale by Vitra) will run you six hundred bucks. But it's truly a timeless piece of furniture. And a masculine manifestation of form and function that you'll enjoy sitting in for decades. Earlier chairs were made with Brazilian Rosewood veneer, which is no longer available due to a worldwide embargo since 1992. Original rosewood chairs now sell at auction for upwards of $10,000. The chair now comes in ten leather and sustainable wood combinations. Chairs are finished with Greenguard, a breathable coating that protects against UV rays and spills. Nearly a quarter of the materials used are recycled. Watch as the chair is debuted on NBC's "Home" show broadcast in 1956. There is mention of the chair in the Steely Dan song "Things I Miss the Most."